Some of us had lunch at the Blacknest golf club café “The Nest” recently and were made very welcome. They are keen to encourage cyclists. Small groups are welcome; larger groups please call 01420 22888 beforehand. 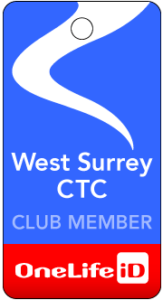 The manager offered 10% discount for West Surrey CTC members and would be happy to discuss special menus for group bookings. Though he didn’t mention it, it might be tactful for cleated riders to use the side entrance, as people in spiked golf shoes are asked to do.